An investigation into the effect of varying pH on the yield of apple juice by pectinase. An investigation into the effect of varying pH on the yield of apple juice by pectinase Hypothesis There will be an optimum pH for pectinase activity. Deviations either side of the optimum will result in decreased pectinase activity. Biological Knowledge Fruits are comprised mostly of unspecialised tissue called parenchyma. The parenchyma cells have thin walls made of two layers. The outermost of these, the primary cell wall, is formed from cellulose fibres called microfibrils surrounded by a matrix of pectins, hemicellulose and proteins. In unripe fruit the pectin is bound to cellulose microfibrils in the cell walls. Such pectin is insoluble and the liquid within the cells remains fluid. During ripening, pectin is partly degraded and solubilised by indigenous pectinases. The result is that the pectin becomes more soluble and its grip on the surrounding cell walls is loosened. One consequence of the partial breakdown of insoluble pectin is that it becomes soluble in water. Some of the pectin molecules are released into the juice. The presence of this polysaccharide increases its viscosity. Pectin is a polysaccharide comprised of at least three components. The principal polysaccharide is polygalacturonic acid and this is normally combined with polygalactose and the highly branched polyarabinose. In addition, the carboxyl side groups of galacturonic acid are partly esterified with methanol residues. Pectinase is an enzyme, a globular protein that hydrolyses pectin. It splits the bonds between the carbon 1 and the carbon 4 atoms of galacturonic acid, thus shortening the pectin chain. 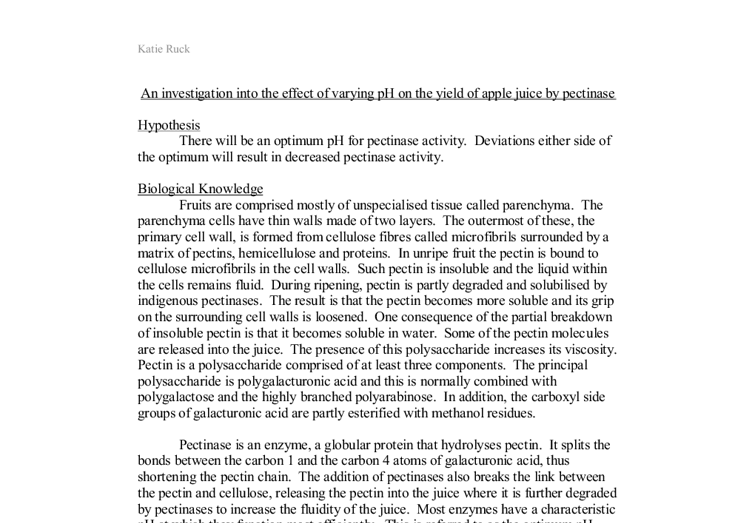 The addition of pectinases also breaks the link between the pectin and cellulose, releasing the pectin into the juice where it is further degraded by pectinases to increase the fluidity of the juice. Most enzymes have a characteristic pH at which they function most efficiently. This is referred to as the optimum pH. Amino acids, from which all proteins are made, contain both acidic (COO-) and basic (NH3+) ...read more. In order to determine the volume of juice contained in the measuring cylinder, evaluate the following calculation: mass of 10cm3 measuring cylinder containing apple juice (grams) - mass of an empty 10cm3 measuring cylinder (grams) = mass of apple juice (grams) Assuming that 1gram of solution is equivalent to 1cm3 of solution, the mass of apple juice found using the above equation could be directly converted to volume of apple juice in cm3. For a fair comparison of pectinase activity to be made the flow rate will be calculated for each repeat at each pH tested, by evaluating the following calculation: volume of juice in measuring cylinder (cm3)= flow rate (cm3/seconds) filtration time (seconds) * This procedure should be repeated three times for each of the nine pHs tested ranging from pH1 to 9.5, ensuring that the blender container together with the blades are washed thoroughly with water and dried between each pH tested and that both the filter paper and measuring cylinder are replaced. Diagram Variables The independent variable of the experiment will be pH. This will be altered using nine different pH phosphate buffer solutions. PH paper will be used to verify that the buffer solution is indeed of the correct pH before reacting the pectinase and buffer solutions. In order to produce reliable results, other variables that may affect pectinase activity need to be controlled. As the concentration of pectinase increases, the number of active sites will also increase. Provided that there is an excess of substrate molecules, the rate of reaction increases in proportion to the concentration of the enzyme, thus resulting in a higher yield of apple juice passing through the measuring cylinder for the pH being tested. Therefore, the concentration of pectinase will be kept constant at 100%. On each repeat, 1ml of pectinase will be taken from the same sample/beaker so as to maintain consistency. The volume of apple puree placed into the plastic filter funnel will be kept constant throughout the investigation to provide roughly equal volumes and therefore concentration of pectin for each repeat at each pH. ...read more. By running through the procedure I found it was beneficial to use a spatula to transfer 25grams of the pureed apple into the beaker as doing this would minimise spillages. During the pilot study it was found that a twelve-minute filtration period produced significant variation for manageable and therefore comparable flow rates to be calculated. After twelve minutes, the volume of juice obtained when pectinase reacted in pH3 conditions was approximately 0.8ml and roughly 0.2ml of juice was obtained in pH9 conditions (Please note that these are only approximate values and were measured by using a 1ml graduated pipette to draw up the juice that passed into the measuring cylinders. Therefore the values are likely to be influenced by the presence of air bubbles within the graduated pipette and transfer losses). The only available fungal pectinase was of 100% concentration. In order to slow down the reaction rate thus allowing us to see a difference between the flow rates obtained at different pHs, a small enzyme volume of 1ml pectinase was added to the pureed apple. This volume resulted in sufficient variation between pHs, therefore allowing a conclusion to be formulated. The shape of the predicted graph resembles that of a bell, therefore it was decided that more than five pHs (i.e. nine) should be tested in order to formulate a valid conclusion regarding the effect of pH variation on pectinase activity. The pHs to be tested range from pH1 to pH9.5 therefore enabling the activity of pectinase to be observed in acidic, neutral and alkaline conditions. A larger number of acidic pH phosphate buffers are being used because in the pilot study (though values were inaccurate) a greater volume of juice passed into the measuring cylinder when pectinase reacted in pH3 conditions as opposed to pH9 conditions, thus illustrating that the optimum pH for enzyme activity is acidic. 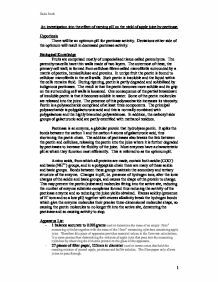 Also, the product information sheet for the pectinase enzyme solution being utilised states that relative pectinase activity increases as pH4.5 is approached again indicating that pectinase has an acidic optimum pH. Katie Ruck 1 ...read more. This ensured that the temperatures of the enzyme and substrate molecules were kept constant so that results were more accurate. i) pH - Any change in pH affects the ionic and hydrogen bonding in an enzyme and so alters it shape. Effect of temperature on the enzyme pectinase in fruit juice production. Temperatures below and above this optimum temperature have considerable effects on the way enzymes work. At low temperatures, near of below freezing point, enzymes work at a very slow rate but as the temperature is increased to the optimum, the rate at which the enzyme works on pectin increases. The reason for this is that it is unlikely to get 100% germination, even in ideal conditions. For instance, if 15 seeds are sown and 1 doesn't germinate or I miscount by 1 then there will be an error of 6.7%. Fungi feed on dead organic matter or parasites. Fungi are better adjusted at living in acidic environment, including citrus fruits. Therefore it can be suspected that fungi have a low optimal pH. Hypothesis The optimum pH of fungal amylase is lower than the optimum pH of bacterial amylase. This is because as the rate increases this must mean that more enzyme molecules are reacting with the substrate at one time, seeing that the reaction and dislocation time is constant at constant temperature, causing more substrate-enzyme collisions to be unsuccessful due to saturation. This effect can be explained mathematically.